I have finally gotten around to posting this, sorry for the delay, I had so much uni work to catch up on so blogging took a back seat for a little bit. As I stated in my last post I seen a picture on Facebook which inspired me to have a go at making these for myself. 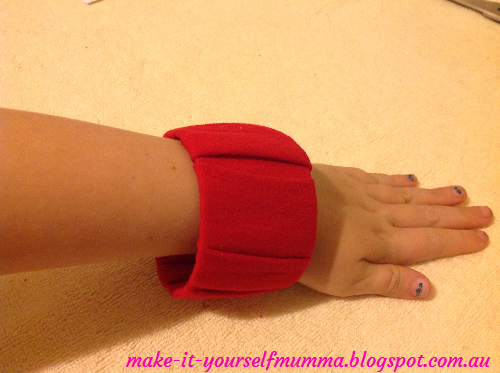 The original post can be found on fashion blog but my bangles were made slightly different. I have added some tips about things I learnt along the way to make them easier to create. Why not give this project a go, I found it so fun and easy. 1. 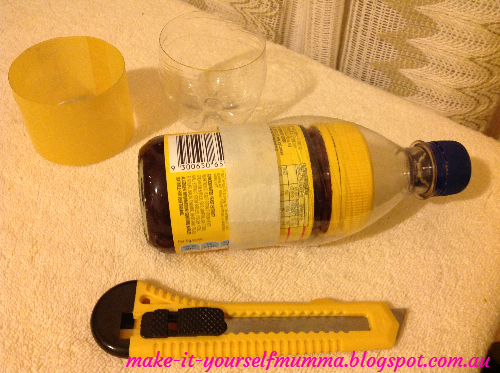 Stick a ring of tape around the bottle, ensuring that it is as straight as you can get it and that the ends meet up seamlessly. This can be tricky so take the tape off and start again as many times as you need to (I had to try a few times with the duct tape). I fit one ring of masking tape and one ring of duct tape on my bottle, leaving a few millimetres of space in between. I used both masking tape and duct tape as I thought it would be nice to create bangles of different widths. 2. Now cut closely along the edges of the tape with a Stanley knife. Go slowly and pay careful attention to keeping to the line of the tape, it is much harder to trim precisely with scissors afterwards and you don't want any big dents out of your bangle. 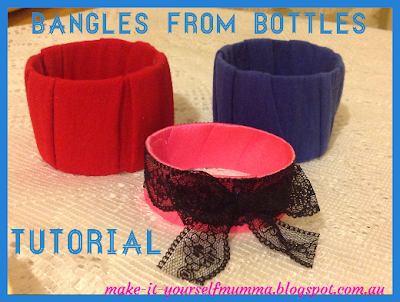 It's ok if you have small imperfections, these shouldn't show up in the end as you will wrap the bangle with fabric of some sort. 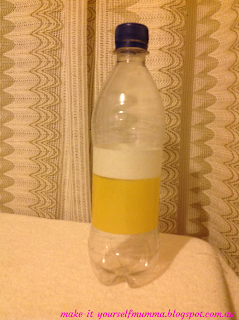 Once you have cut out one side it will be harder to cut the open side (please do not try to support the open end of the bottle with your hand, it is dangerous). TIP: I have used a jar to place inside to keep the bottle firm while I cut, otherwise you might find it quite difficult and possibly even cut yourself. If you need to you can trim the edges with scissors now. 3. For the duct tape bangle get out an old t-shirt. I used one that didn't fit my son anymore, it was pretty much brand new. You could visit your local second hand store to find something nice and colourful or do a clean out of the family's wardrobes to see if there is anything suitable that doesn't fit anymore. Measure around the bottom of your shirt with a tape measure. If your shirt measures smaller than about a metre around, you will need to use more than one strip of fabric to cover the bangle. 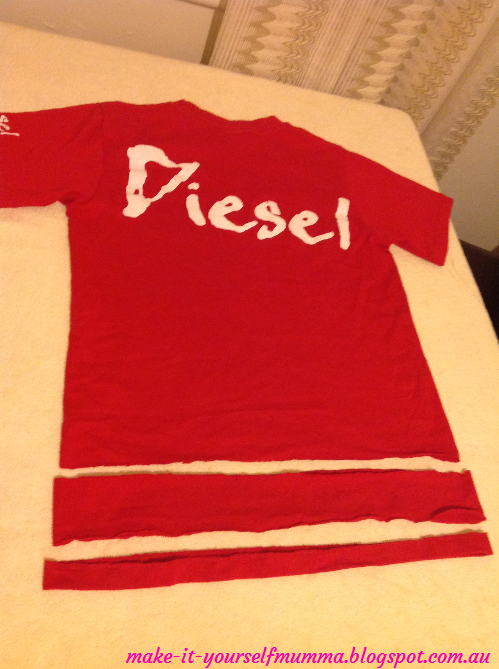 Cut the hem off the t-shirt and measure a 6 cm wide strip (starting from the bottom of the shirt after the hem is gone), marking it with a lead pencil or special fabric marking pencils/textas. If you need more than one strip mark another right on top of the same width. Cut the strip (or strips) along the line with sharp scissors (preferably fabric scissors). Cut the side of the shirt along one of the side seams (if you have not done so already) and remove any tags. 4. Glue along the end of one strip and fold the edges of two sides (about half a centimetre each side) onto the middle of the strip. 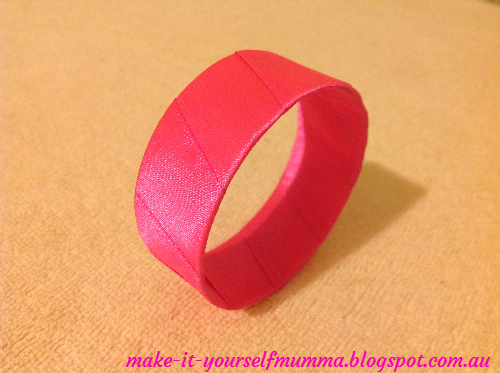 Place the glued end into the inside of the bangle on a bit of an angle. Hold it in place until the glue has dried to prevent it from moving whilst you are wrapping. 5. Now start winding the fabric through and around the bangle on a slight angle. 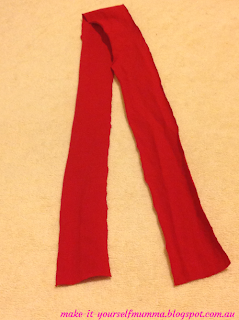 Pull the fabric firmly as you go so that it curls behind leaving you with a nice edge. 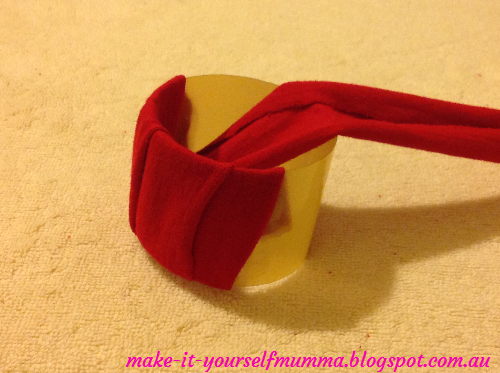 You don't need to glue the fabric down along the way but you can if you want to. If you do, be sure to glue inside the bracelet not the outside as the glue may seep through the fabric and be visible which you don't want. 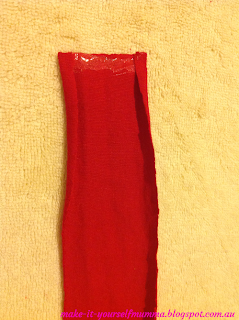 When you reach the end trim the fabric to ensure it fits inside the bangle but won't be hanging out at all. Glue along the edge and hold until dried. 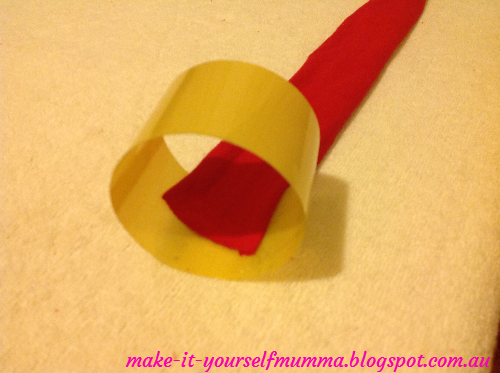 If your fabric strip was not long enough to finish the bangle, be sure to trim the fabric and glue the end inside the bangle to finish that strip off. Glue a new strip just on top of the that inside the bangle and continue wrapping it around til the end. 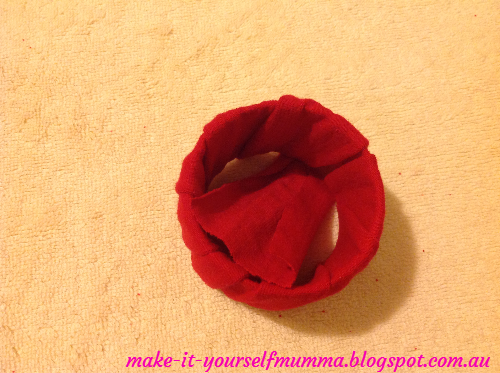 If your fabric strip has a seam make sure it sits inside the bangle so that you can't see it from the outside (unless you want this that is). If it doesn't then you can cut the strip and start a new strip inside the bangle so that the outside looks more seamless. Now you have a finished bangle to wear or give as a gift. Here is my daughter modelling the finished product. She loves them so much! You can add further decoration if you like but I think these ones are quite nice the way they are. Use materials that have a nice pop of colour to make a statement. I then used the thinner bangle from masking tape and wrapped hot pink satin ribbon around it which was 2.5 cm in width. I used about a metre in length. I did put a small blob of glue on every second or third wrap of the ribbon just to make sure that it was secure and that it sat perfectly. 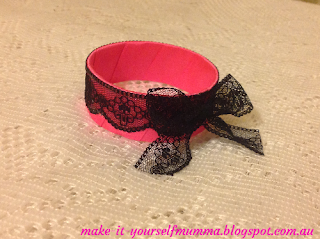 I then glued a scrap of black lace on the edge and a lace bow which complimented it wonderfully. You really can make so many different variations with these, just play around with different materials and decorations and have fun with it. I have some cute and easy mother's day projects coming up soon so be sure to check back soon. I will be posting tutorials on hand made items that are inexpensive and thoughtful, projects that are great to do with the kids. Thanks Kate, they are pretty funky, and so easy to make. Hi...thanks for stopping by my blog and for commenting on the lightbox post. I also wanted to stop by here, because I wasn't sure if you knew that your blog comments are set to "No Reply". This means there isn't an email address attached to your blog account and there isn't a way for anyone to respond back to your comment. If you ever want to change that, there is a tutorial on my right side bar labeled "Are you a no reply". Great idea Missy! Love the tutorial.